The Sola Clinometer (ARISTO) is made in Austria with their typical engineering perfection. 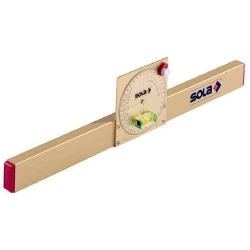 The Sola is magnetically attached to a drill rig or any machine where the operator has to know the angle of inclination. Reading of the angle to 15 minutes. Can also be read in percentage. The Sola comes in two different sizes to suite most requirements.